No doubt the largest of our exhibit folio, this nearly metre-long parchment uses a Humanistic Book Hand (script), likely Italian in origin, featuring a fragment of an antiphon we unfortunately could not identify. We nonetheless present it here for your enjoyment since the clever use of shadows & shading within the illuminated initials creates a sense of depth and perspective not found in any of our other exhibit folios. Subtle tones of red, yellow, blue and white, along with large font lettering make this one of our most legible folios, but also our most elusive! Can you identify this (fragment) of an Antiphon? 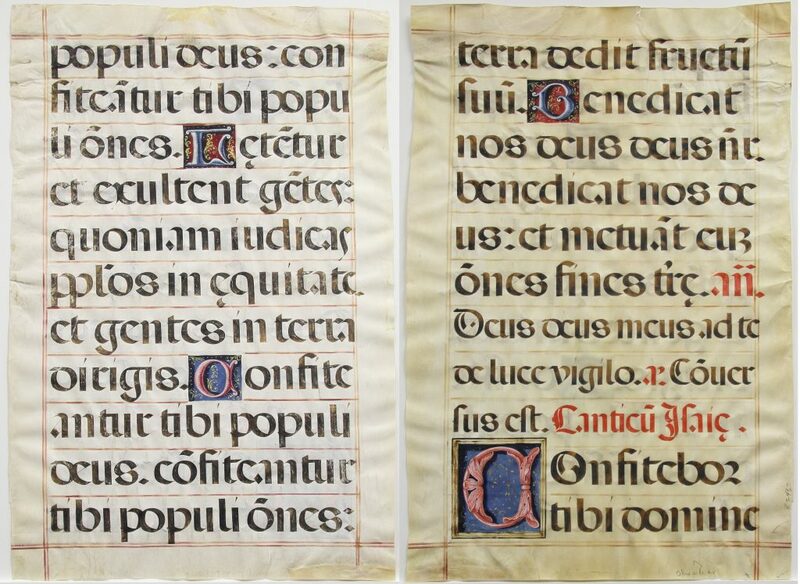 Title: "Fragment of an Antiphon"
Ruling: 11 lines of text (67 mm – 70 mm); Single column (750 mm x 460 mm); Ruled in ink, double ruling on margins. Baseline and descender line ruled in lead.